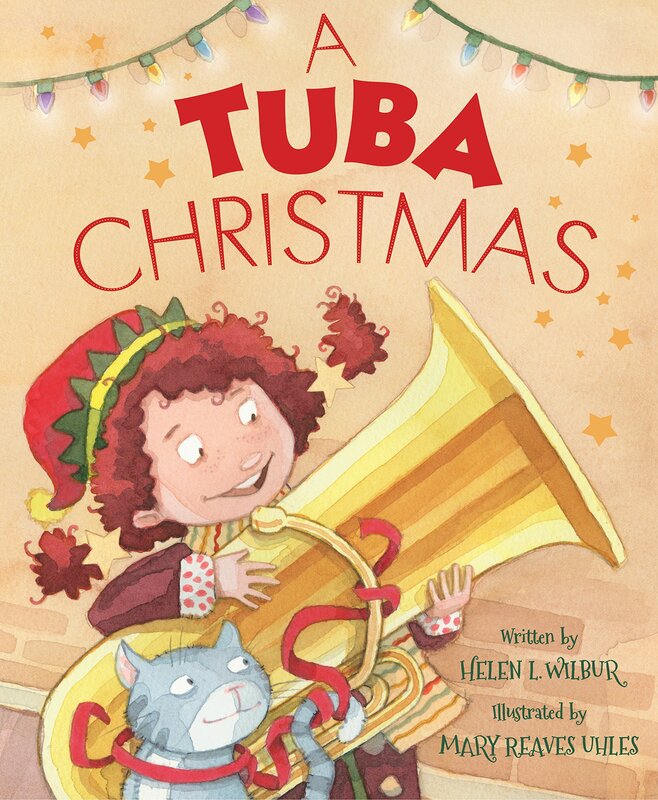 Author Helen Wilbur has new picture book titled, A TUBA CHRISTMAS, illustrated by Mary Uhles. It’s now available in bookstores. They have agreed to share a book with one lucky winner. All you have to do to get in the running is to leave a comment. Reblog, tweet, or talk about it on Facebook with a link and you will get additional chances to win. Just let me know the other things you do to share the good news, so I can put in the right amount of tickets in my basket for you. Like many writers, I am often asked where I get my ideas. I always have the same response. Ideas are the easy part. Making the ideas into a compelling story is the tough part, especially when it comes to writing for children. I wanted to write a holiday story but, in this case, I had no ideas. I searched for inspiration but nothing appeared. I wanted something bright and fresh, a little different. Every idea I had seemed trite or overdone. Then came the tuba…. Every five years I gather with four friends in Chicago to celebrate our college reunion. We met our freshman year assigned to the same floor in the dormitory at the University of Chicago. Our class was small and few show up for the reunions. I have no idea who many of them are, even when I decipher the HELLO I’M badge. 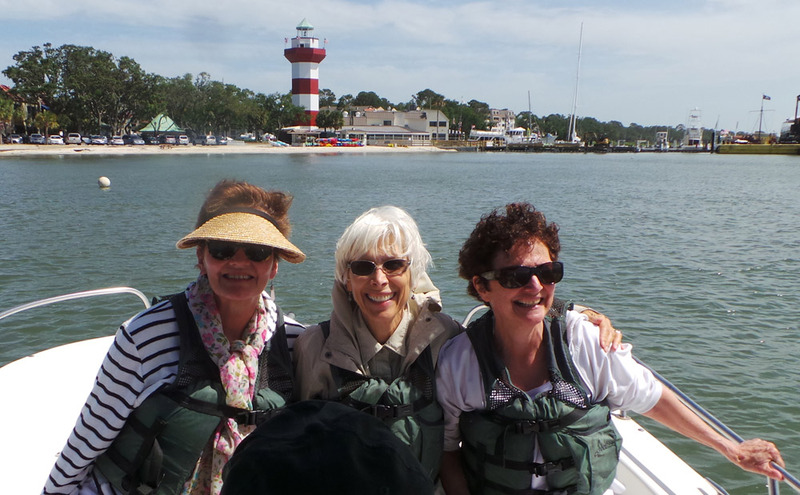 But the five of us always go together – Barbara, Martha, Melanie, Vivian and me. Vivian is the musical one. She arrived at the dorm with something few had – a stereo system. We’d play our prized recordings of the Beatles, Stones, Jimi Hendrix, Cream, Jefferson Airplane on her stereo, dance, sing and generally makes fools of ourselves. 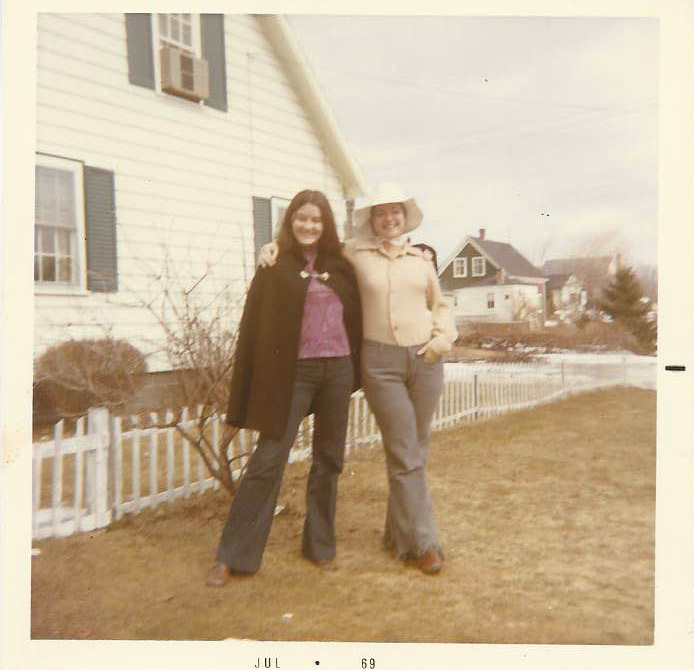 Viv also played the clarinet and worked at the student radio station WHPK. All of this culminated in her distinguished career as a radio journalist for WKSU in Ohio where she focused on reporting on the arts and food. At our last reunion she was telling us about learning to play the tuba for her story on Tuba Christmas……I had my idea. I long ago learned to trust the art editors at Sleeping Bear Press to find the right illustrator for my book. (Readers are often surprised to learn that, unless you are also the illustrator, an author has little to no input into the illustration process.) When my editor told me that they had selected Mary Reaves Uhles, I looked at her recent books and knew she was perfect. 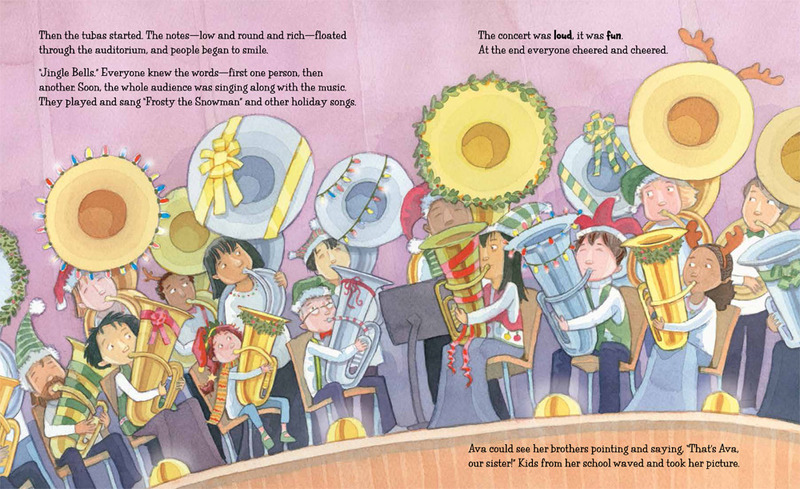 For A Tuba Christmas she captured the images in my head and gave them life on the page. What really made me laugh was that she gave Ava a little cat who looked just like my cat Bartleby. I dedicated A Tuba Christmas to my dear friends. Who know what idea one of them might give me at our next reunion? This is Mary picking the story up from Helen. . . In November 2016, I received an email asking about my interest in this project and at the time I had never heard of a Tuba Christmas. I read Helen’s manuscript thinking, “ok this is cute”, but when I got to the end and read the note about the tradition behind tuba Christmases, I was intrigued. I immediately googled ‘tuba christmas’ and sure enough, there were hundreds of people playing Christmas songs on tubas! 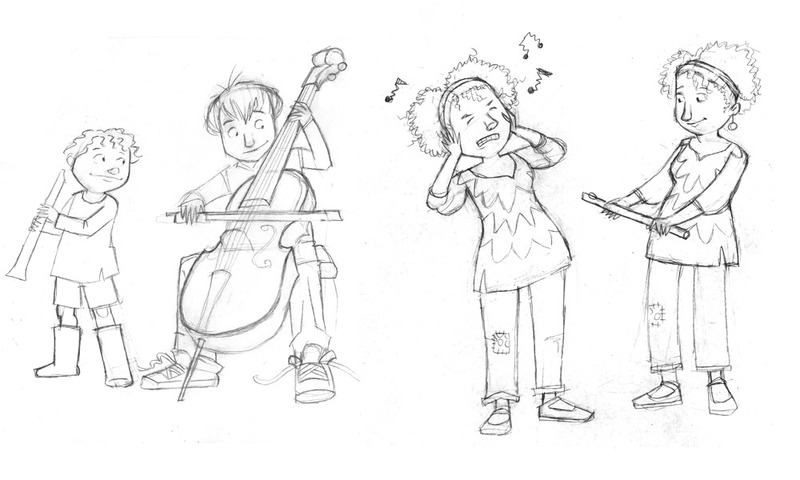 I emailed the creative director at Sleeping Bear that I was in and began work on character sketches. Happily I was paired with art director Felicia Macheske, who I worked with on The Little Kids’ Table. Living in Nashville I know a lot of musicians and they are a pretty colorful bunch. I wanted Ava’s family to have an ‘elegant hippie’ feel… if that’s a thing. I knew I wanted her mom to be a bit artsy, her dad to have a beard. I knew I wanted Ava’s ponytails to reflect her mood. I always do my characters in random scenes and positions that won’t necessarily appear in the book… doing this feels like I’m drawing them in conversation. It helps me imagine whole backstories for them, things they might fight about, or laugh about. 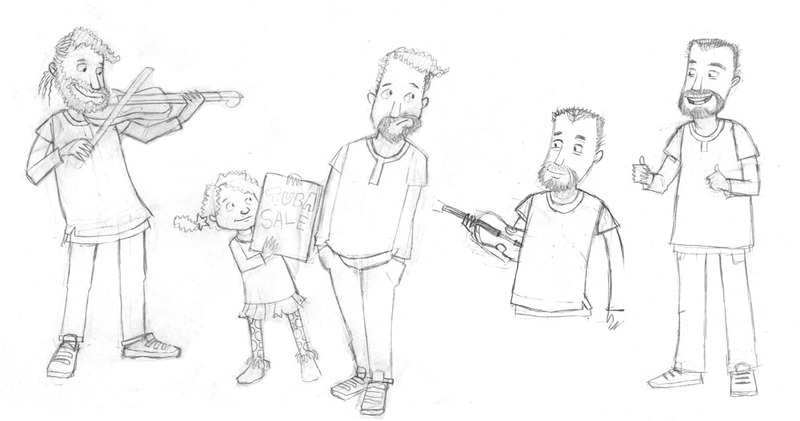 Here are some of my character sketches for Ava, her parents and her brothers. 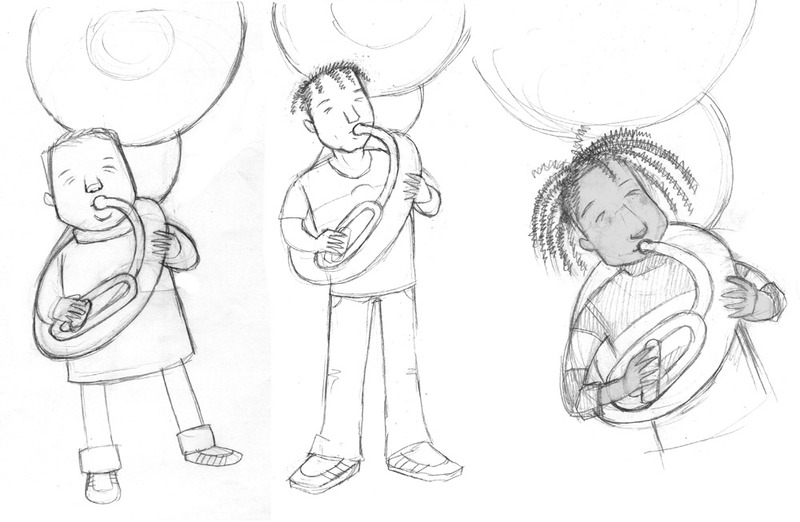 The other big character in the book is the tuba itself! Boy, did I sweat that one. This book is dedicated to my son’s middle school band and teachers because they opened class up for me to come draw kids and tubas. 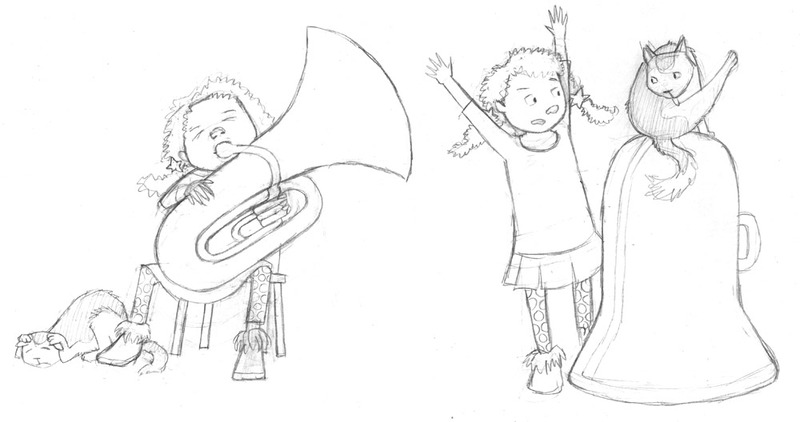 I researched all kinds of tubas and re-drew Ava’s about 4 million times. For some reason, they just weren’t looking right to me. One night, late in the process, after several sketches had already been approved I attended a band camp concert. As the students played I stared at the tuba section and finally saw what I had been doing wrong. I spent the next week redoing several sketches…. here’s a sketch and final revised after that concert. 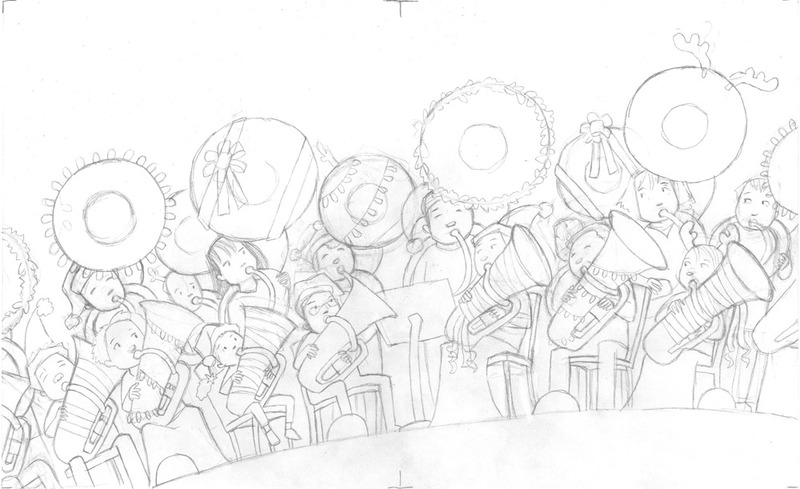 A Tuba Christmas takes place over a longer time frame than some picture books. Ava must choose to practice and get better to get beyond the ridicule she feels for her tuba dreams. In order to make this believable I had to put the characters in different wardrobes… but I still wanted each character to be easily recognizable to young readers. Felicia’s suggestion was to give each character their own accessory that would move with them. For Ava this was the star barrettes in her hair, then later in the book she wears the same winter jacket. I also created color palettes for each character so that even as they changed clothing, they were still purple (mom) or green/aqua (dad). However I didn’t stick to certain color palettes as much with Rodney or Ava… I wanted Ava to have an outlandish wardrobe, something that was as unique as her taste in musical instruments… and Rodney, with his dreads, I felt was pretty recognizable. I did incorporate Felicia’s suggestion of dressing him in a bright red dress shirt for the concert. It was a great tool to bring attention to his hands on the spread where he explains what the tuba concert is. Finally I have to mention one of the best lessons I’ve ever learned in picture book illustrating. It’s the “everything is a character” rule. That means the setting, the background people, anything that is on the page should be treated as unique to the main characters, to the story. I tried to keep that in mind with every illustration. For the opening pages I decided to introduce Ava’s family in literal snapshots. The frames were designed to match their personalities. 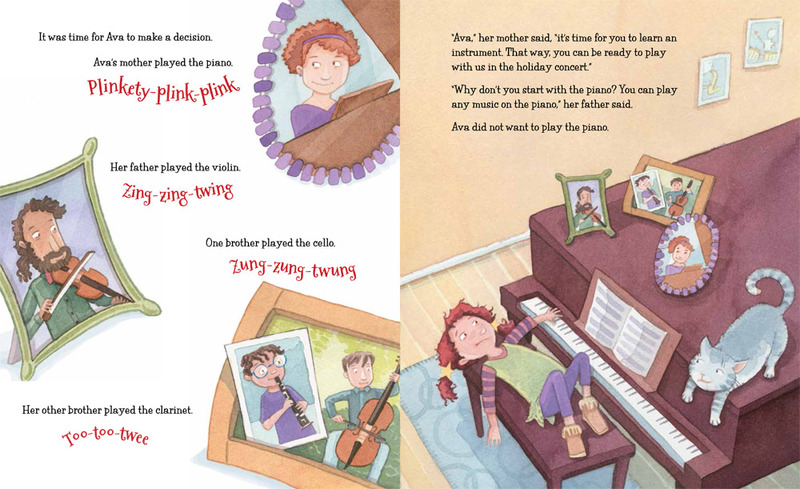 We see these same frames again on the facing page as Ava is less inclined to practice piano. 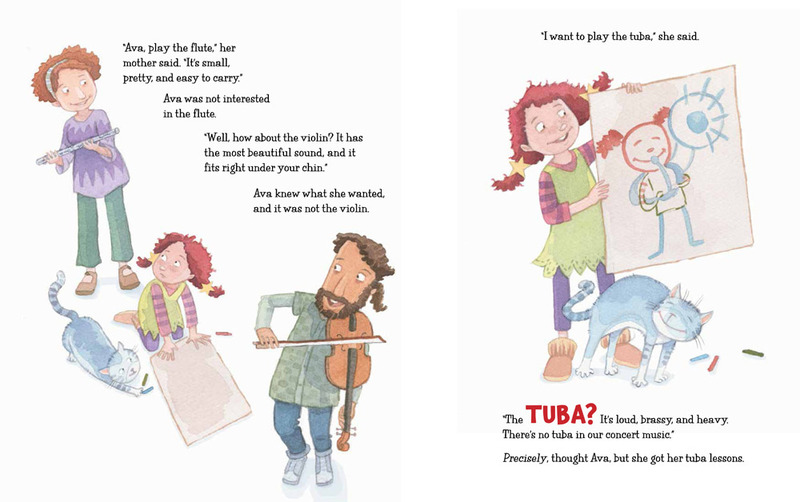 And of course one background character who never speaks but definitely has an opinion about the tuba is Ava’s gray cat. 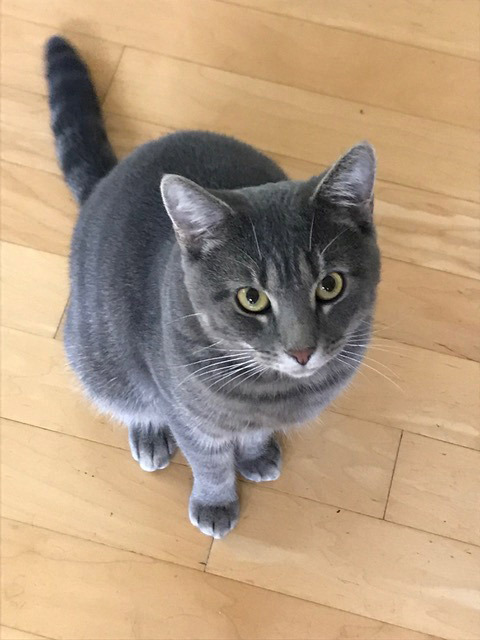 After publication Helen sent me a picture of her cat, who, unbeknownst to me, is a gray cat! If I can be bold enough to say… I think all this attention to detail paid off. 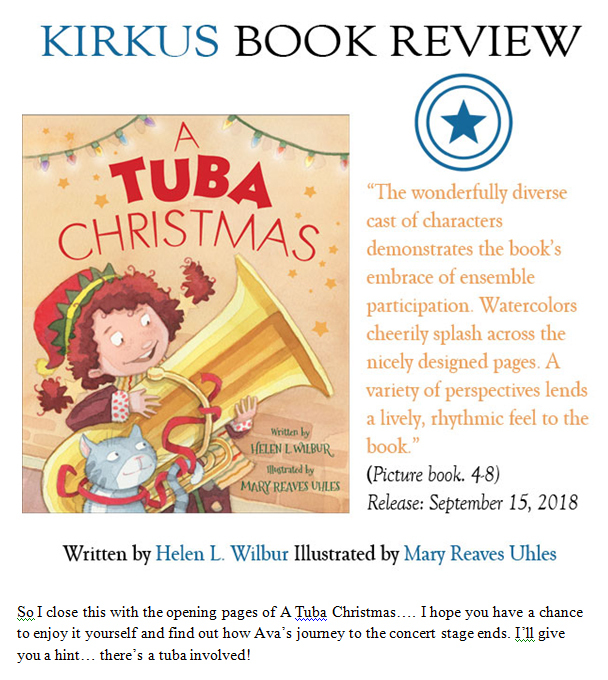 In late August, Helen and I were notified that Kirkus gave A Tuba Christmas a STARRED review! Her books for children’s publisher Sleeping Bear Press include M is for Meow: A Cat Alphabet, Z is for Zeus: A Greek Mythology Alphabet, Lily’s The Victory Garden and Little New York, E is for Eiffel Tower: A France Alphabet, F is for Friendship: A Quilt Alphabet, T is for Twin Cities: A Minneapolis/St. Paul Alphabet, Finnegan and Fox: The Ten Foot Cop and B is for Beacon: A Great Lakes Lighthouse Alphabet. Helen L. Wilbur has been a librarian, run a catering business, acted, taught school, and worked in the electronic side of the publishing world. She has a B.A. in English Language and Literature from the University of Chicago and an M. L. S. from Columbia University. Mary Reaves Uhles has created illustrations for numerous books and magazines. Her newest picture books include A TUBA CHRISTMAS (Sleeping Bear) and THE TWELVE DAYS OF CHRISTMAS IN TENNESSEE (Sterling), both available Fall 2018. 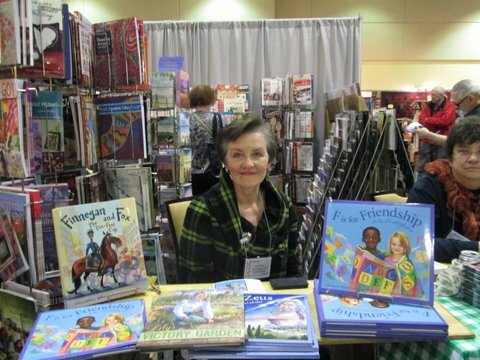 She has also illustrated THE LITTLE KID’S TABLE by Mary Ann McCabe Riehle (Sleeping Bear); KOOKY CRUMBS by J. Patrick Lewis (Kane Miller); and BEYOND THE GRAVE Choose Your Own Adventure Series by Dottie Enderle (ABDO Magic Wagon Press). Mary has twice been awarded the Grand Prize for Illustration from the SCBWI Midsouth Conference and her piece, EAT was a finalist in the 2014 SCBWI Bologna Book Fair Gallery. Prior to beginning her career as a freelance illustrator, Mary worked as an animator on projects for Warner Brothers and Fisher-Price Interactive. 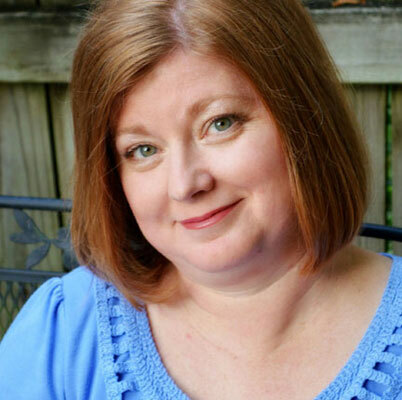 As Midsouth Illustrator Coordinator of the Society of Children’s Book Writers and Illustrators, Mary lives with her family in Nashville, Tennessee. Since creating characters and stories is her favorite thing in the world (even more than mocha fudge ice cream) she feels mighty lucky to do it every day in her hilltop studio. Thank you Helen and Mary for sharing your book and it’s journey with us. It looks like a very special book. Good luck! What a fun story story & interesting back story as well. My family and I have attended Tuba Christmas performances at the Kauffman Center in Kansas City the past five years. 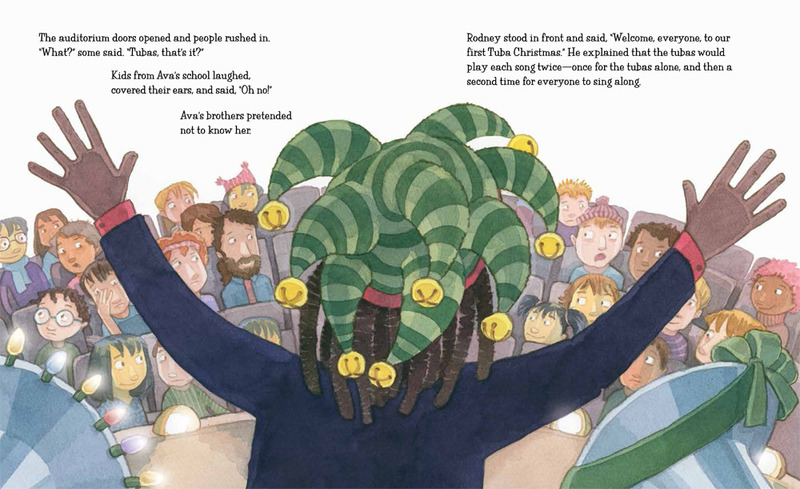 How wonderful to know this is now in a picture book! 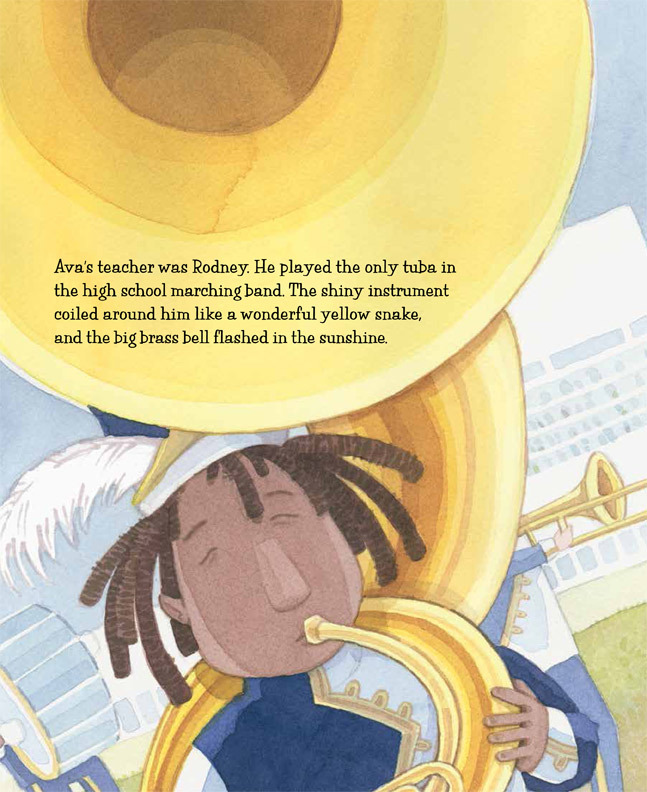 I loved reading about how this story was created and what a fantastic idea to have the main character pick a tuba! Beautiful illustrations as well. I am very excited to see and read this book. Reblogged (see above), posted on my FB page and my blog’s FB page, tweeted. Elementary general music teachers (my former profession) are going to love this book. Thank you, Helen, for writing it, and Kathy, for posting about it. A unique story for the holidays involving music…love it! Congratulations! This seems like a great book; I love seeing the in-progress illustrations, too! This looks great! 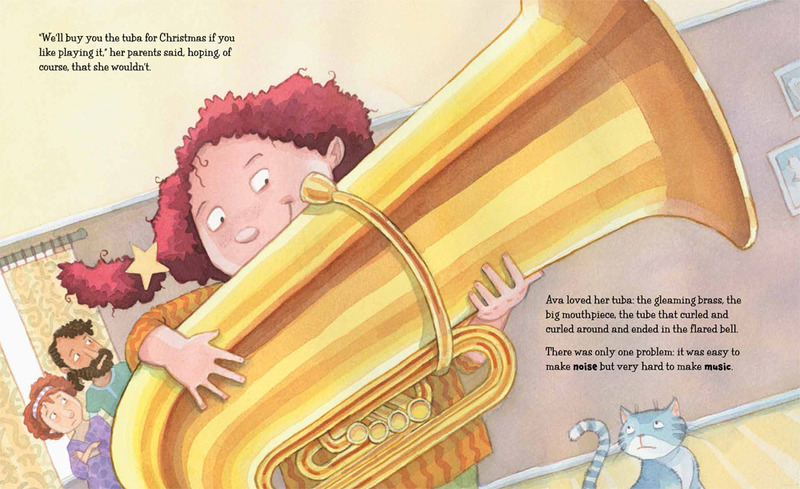 I loved learning the whole book process from idea to illustration and finding out there really is such a ‘thing’ as Tuba Christmas. Thanks for including us Kathy! What a great story! Thank you for sharing this book’s delightful journey! I love to hear about other people’s book journeys! What a beautiful looking book! Gorgeous illustrations!